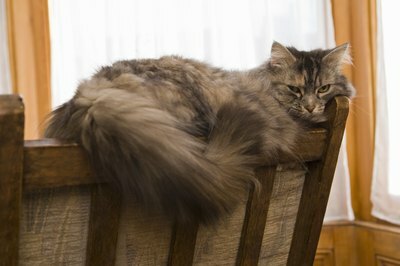 A couple of fleas on your kitty could mean a couple hundred of them in your home. Fleas can cause quite the headache for you and your feline friend. Not only do the bites itch and annoy your kitty, but she may become allergic to the flea saliva. A good flea medication can be your -- and your kitty's -- best friend. You can apply Frontline Plus to your healthy kitten at 8 weeks old; Advantage is safe for kittens 9 weeks or older. You apply both products in the same fashion: Spread the fur on the back of the neck and apply the liquid to this spot. Each lasts for one month. Both Advantage and Frontline products are waterproof. Advantage Multi kills several types of parasites. Both Frontline Plus and Advantage II are similarly priced across the market, although you may be able to find one significantly more inexpensive while shopping around. A word of caution: Do not purchase flea medications from untrusted or unknown sources. This includes online shopping. Many of these products aren't real and aren't safe for your pets. (SEE REF 6) Both of these products are considered safe, although all pesticides can be toxic, especially when used incorrectly.